Even though he was born in Belgium, Bilal Ghomraoui has a strong connection to the United Arab Emirates. Ghomraoui lived in Dubai for 13 years growing up, and refers to it as the closest thing he has to home. The 24-year-old triathlete, who is obsessed with bicycles, had an idea in the back of his mind about how to honor the two most important places in his life. On Oct. 15, Ghomraoui began a 7,000-kilometer unsupported cycling journey from Brussels to Dubai, finishing on Dec. 4. Not to say the trek wasn’t physically demanding, but Ghomraoui was certainly prepared for it. As a triathlete, he has spent an average of 10 hours every week training for the past two years. Ghomraoui completed IRONMAN Barcelona—finishing eighth in his age group—two weeks prior to starting his journey. The most challenging part, he said, was staying focused and mentally strong. Ghomraoui aimed to ride a minimum of 125 km per day (typically 5-7 hours) in order to accomplish this feat. He pedaled 750 km from Brussels to Regensburg, Germany, during the trip’s first leg. He then cycled 1,250 km along the Danube River from Regensburg to Belgrade, 1,000 km from Belgrade to Istanbul, 1,800 km through the center of Turkey from Istanbul to Van, and 2,000 km from Van to Bandar Abbas, Iran. 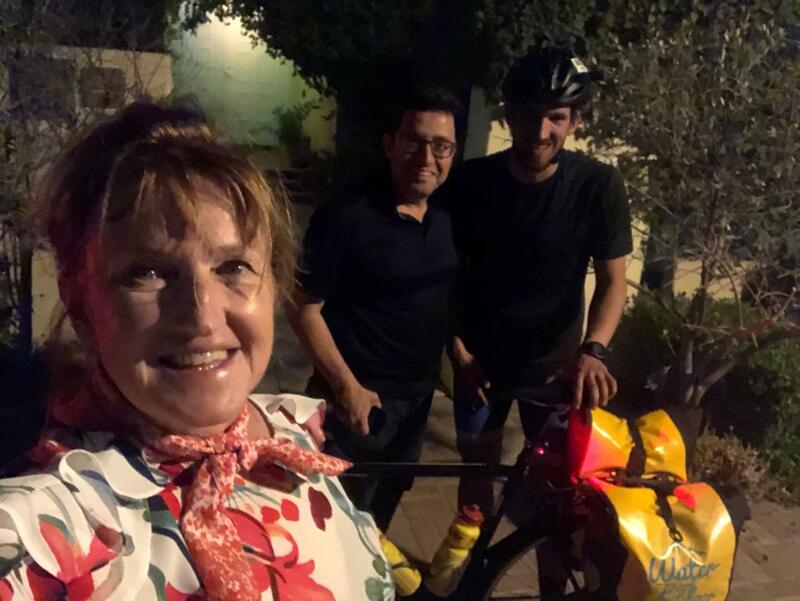 Ghomraoui then took a plane across the Strait of Hormuz to Dubai, cycling the final 30 km from the airport to his parents’ house, completing his 10-country journey in 51 days. While Ghomraoui had to deal with altering his pre-determined route because of weather issues—including taking a plane from Iran to UAE when he originally planned to take a boat—he never once felt unsafe. Ghomraoui, whose Lebanese and Belgium passports allowed for smooth travel throughout the trip, spent the majority of his nights in people’s homes and just a few in hotels or tents. He said people were hospitable, offering shelter and food, especially in Turkey and Iran despite reports of certain areas being dangerous. Ghomraoui plans to spend a month with his parents in Dubai before returning to Belgium to find a job. Needless to say, he probably won’t be cycling back there. I turn the corner down East 95th St. Almost home. I gaze down the block and there you are. Quietly pacing with a cigarette in hand, like a sentry guarding a priceless artifact, you take a few steps, turn, and retrace your path. The words "cook" or "chef" and "Michael LoRé" don't belong in the same sentence. They never have. They never will. Well, except just now, but you get the point. Much like my minuscule artistic and musical talents, I lack competent culinary capabilities.